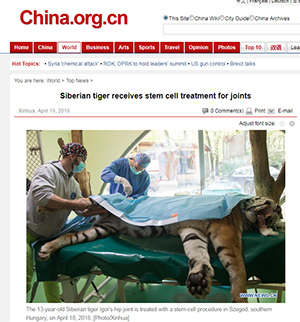 Siberian tiger receives stem cell treatment for joints. Igor, a Siberian tiger at the Szeged Zoo in southern Hungary, was treated with a stem cell treatment procedure for his hip joint in Szeged on Wednesday. Április 19-én jelent meg összefoglaló az eseményről a China.org oldalán.